Our desks can get so messy and drab. 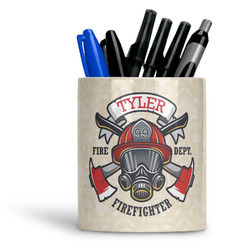 Get a personalized pen and pencil mug to help you get organized and brighten up your work area! 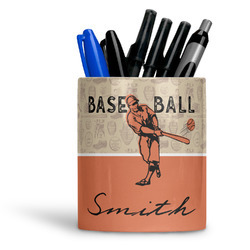 This ceramic mug is the perfect way to organize all of your pens and pencils. This mug has no handle and is approximately 3.75" in diameter with a height of 4.75". 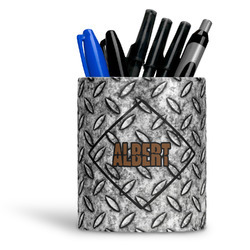 Create a fun design, something that motivates you, and we will print it right on your pencil holder! Go into our design center and choose from the thousand of backgrounds and graphics to create something that will make you smile! New to our design center? Give us a call and we can walk you through how to use it! Have a wonderful time designing! If you are looking for other office supplies, you may be interested in our clipboards or mouse pads. I would have given 5 stars because next time we do want the print bigger. No fault on your part, that is what we sent you. But overall, nice quality and speedy delivery. You fully exceeded my expectations! I received my order before delivery date. Will definitely use you again! Thank You! Love my desk items.. received faster then expected!! Great job! Wonderful ordering experience! Personalization made easy! Love it! !